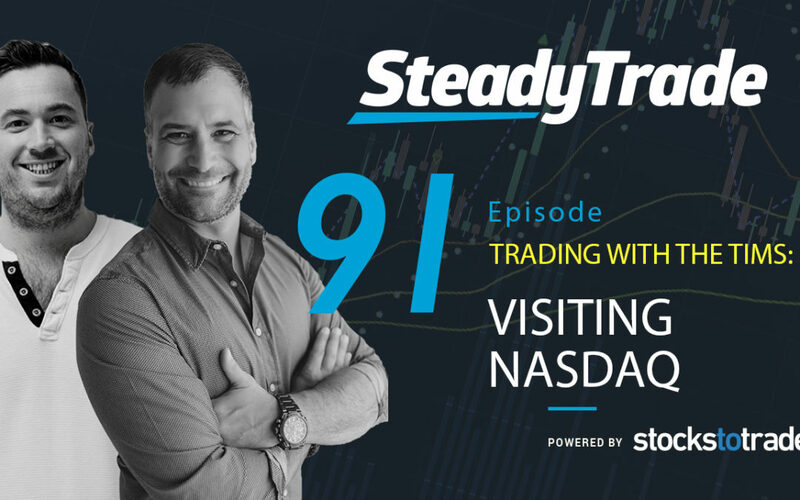 Along with day-trading celeb Tim Sykes, SteadyTrade co-host Tim Bohen hit not just one but two huge trading milestones in recent memory: visiting Nasdaq and presenting at TradersExpo in New York City. In today’s episode, both Tims come together to dish on the highlights of these incredible moments and to offer some invaluable trading tips. On March 12, Tim Bohen and Tim Sykes were invited to ring the closing bell at the Nasdaq in Times Square. It’s kinda like the Mecca for traders. Talk about a huge and exciting honor! In the episode, you’ll learn more about how it went down, as well as their thoughts on the experience. You won’t want to miss the hilarious reasons why Sykes is glad that they rang the at Nasdaq instead NYSE! TradersExpo is one of the biggest trading shows in the world, with multiple events in various cities throughout the year. This year, both Sykes and Bohen presented at the NYC conference and have plenty to share about their experiences. Sykes even dishes the dirt on why he was banned from TradersExpo for over a decade and why he’s so glad to be back in the circuit. Easier entry. No bones about it: It can be super easy to dive into the world of trading low-priced stocks. All you need is a laptop, an internet connection, and a broker! Momentum. Unlike trading blue-chip stocks, low-priced stocks can come with a high level of volatility that can translate into momentum. But beware! That volatility is a double-edged sword that makes this trading style riskier. Get cozy with volatility. Scared of volatility? Learn how what’s inherent to low-priced stocks can actually be a great teacher for new traders. Newbies are smart to embrace it, as it can serve them well, regardless of which trading style they pursue. The Tims also talk penny stocks: How they’ve changed over the years, how volatility has shifted, how long the runs can be, and how liquid the stocks are these days. There’s a reason why things have shifted from short-selling to long-selling penny stocks in recent years! It’s always refreshing and inspiring to hear what’s new with Sykes, who’s forged an impressive career as a trader and teacher. In this episode, he shares what’s got him jazzed these days, including building schools in Bali and rebuilding the reefs with his charity Karmagawa. Study the past. The past is vital to understanding how stocks might perform in the future. That’s why Sykes has 6,000 lessons in his video library. He’s constantly adding to the archives — so you can study the past and better prepare for the future. Don’t trade if you don’t see your setups. You don’t have to trade every day. Really! But how do you spend your time between plays if they only come along every six weeks? Listen in for Sykes’ take. It’s a marathon, not a sprint. Sykes explains the importance of taking the time to LEARN, like when to buy and when to sell. There are infinite things to learn in the stock market, so take a slow-but-steady approach. Invest in yourself. If you focus on building your brain, mindset, and knowledge, you’re well on your way to learning how to be a self-sufficient trader. So invest in yourself AND your education! Build yourself to build your potential. Have a question or comment about the episode? Leave a comment below or on YouTube! How much did you love this episode? Be sure to leave an iTunes review! There’s no audio file or youtube video for this. Please load. Thanks!